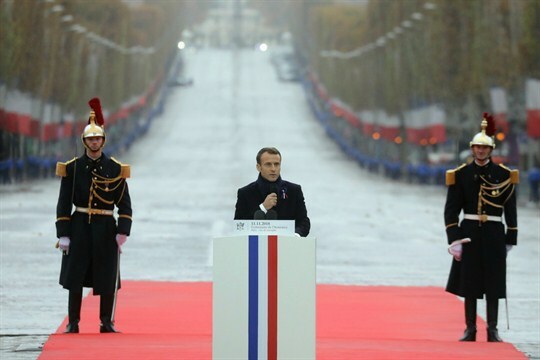 French President Emmanuel Macron delivers a speech during a ceremony at the Arc de Triomphe in Paris as part of the commemoration of the 100th anniversary of the end of World War I, Nov. 11, 2018 (AP photo by Ludovic Marin). PARIS—In many ways, Emmanuel Macron is an unconventional French president. Young, independent and a political novice, he entered the Elysee Palace as a disrupter rather than a defender of the status quo. But if there is one thing that puts him in the mainstream of French presidents, it is his defense of the European Union anchored in a liberal multilateral order. And if there is one thing that puts him squarely in the grand tradition of French diplomacy more broadly, it is his love and talent for political theater.